Following on from its coupe stablemate, this 2 Series Convertible takes over from the older 1 Series range, offering the fun and sensible compact cars in the German firm's line-up. The format remains the same though, with a compact cabin, a power operated fabric roof and a modest selection of powerful yet efficient engines. 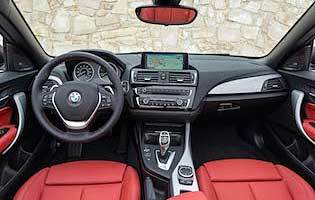 While it would be easy to dismiss this 2 Series Convertible as a reworked version of the old 1 Series drop-top, the differences are more than just a name change as styling, powertrain and usability updates have been designed to lift the car's premium appeal. 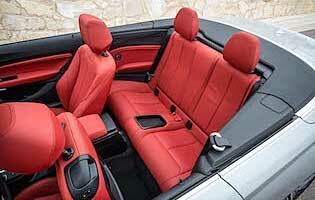 That said, as before the main focus is on the attraction of open-top motoring. And eschewing a complex metal folding hardtop in favour of a lighter and mechanically less complex fabric roof ensures that the car's profile isn't visually compromised. And being a BMW it's important the 2 Series drives well. In default rear-wheel drive guise the car offers a good balance of agility and refinement, allowing ken drivers to have some fun assuming you pick the right engine and gearbox combination. 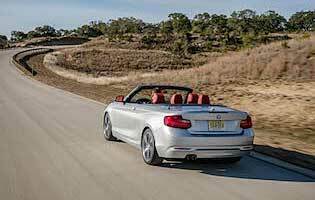 If being seen is more important than thrashing around the countryside, the 2 Series Convertible will happily oblige. It might like the coupe's more focused approach on the road, but there's no denying that it looks the part, roof down, on a sunny day. Keen drivers will, predictably, always go for the coupe variant but it's good to know that the drop-top version remains a capable machine. The emphasis might be more towards style and functionality, but fun can still be had if you opt for a high power engine. 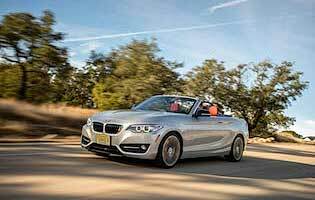 Roof-down refinement levels are high, making this 2 Series a genuine all-year round proposition.